Testing your email campaigns before they go out is one of the most crucial steps in campaign creation. 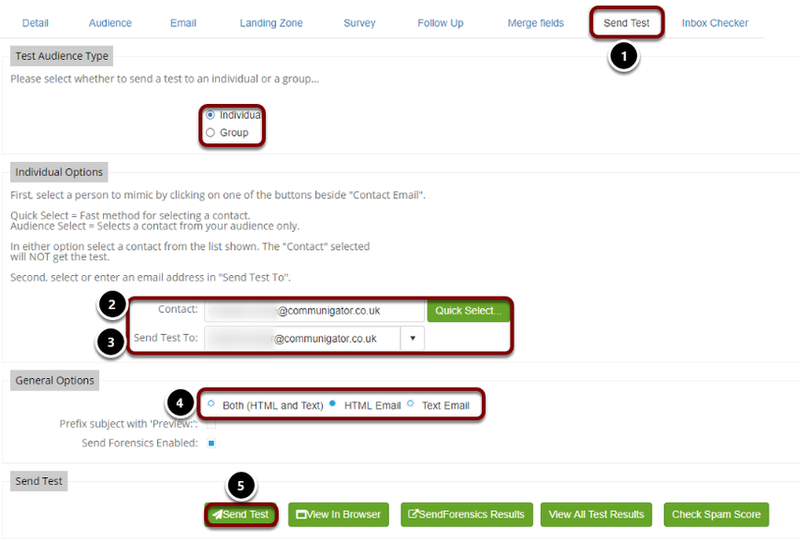 There are several key email features you need to test. For example, dynamic content, email layout, padding width etc. Once inside your campaign click the 'Send Test' tab along the top. Choose a contact to mimic (this contact won't receive the email but any personalisation in the email will be relevant to them). You cannot type in this box so use 'Quick Select' (to choose from the database) or 'Audience Select' (to choose from the audience). Type in the Email Address that you would like the test to be sent to. Choose if you want to test the email in HTML form, Text form, or both forms. Click 'Send Test', red text will appear confirming that your test has been sent. Please Note: If you want to see a design preview of your email when in the email editor, then please read the following article on our Send Test Beta.